To learn, first you have to allow yourself to be taught. When UNCG Coach Wendy Palmer talks with legendary Virginia Coach Debbie Ryan, the conversation often turns to keeping balance in your life – an important lesson. This is a special moment in time for Palmer – her first season as a head coach. 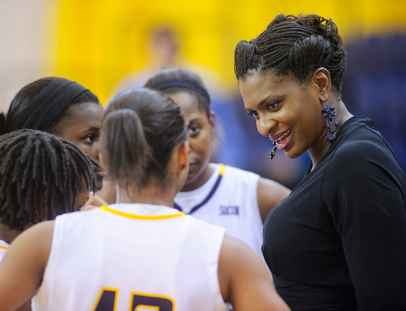 She’d been a two-time All American at Virginia and played in the WNBA for 11 years. She was most recently assistant coach at Virginia, working beside legendary coach Debbie Ryan, who retired at the end of last season. Now Palmer has returned to her native state to coach the Spartan women’s team. She stresses to her players that you have to live in the moment. With each game, the team will have a different focus, she explains. From a teaching/learning standpoint, it’s important to concentrate on one thing at a time. That’s part of having balance and harmony in your life, she says. You have to have focus and determination in every aspect of your life. If you spend too much effort on a relationship and not enough on each class, for example, you’re out of balance. And each requires time management, in addition to concentration. When you’re in class, don’t give basketball practice a thought, she tells them. Be in the moment. When it’s time to rest, rest. When it’s time to work out, work out – with your entire focus. Having eight turnovers may be the best thing that ever happened to you. When you turn the ball over in a game, get back on defense – and stay in the moment. Be disciplined. Don’t dwell on the mistake. “Make the next moment positive,” she says. A player might have an eight-turnover game, and want to stop handling the ball. You can’t live in fear, she says. “Having eight turnovers may be the best thing that ever happened to you,” she explains, if you learn from it and use it to improve. And at some point in life, that player may look back on that experience – and what it taught her. You can’t quit, that’s one lesson. Give 100 percent to each important part of your life. There are small lessons that she teaches: When you walk from class to class, don’t look down – look up, smile at people. Make eye contact. And perhaps the biggest lesson: Never stop learning. “I’m a huge competitor,” she explains. As a player she was called “intense,” “mean,” warrior.” She loves winning, and she loves the game of basketball. Women’s basketball games are free for UNCG students, faculty and staff with UNCG ID. View the schedule. Note: this post was corrected 11:45 a.m. Dec. 16.